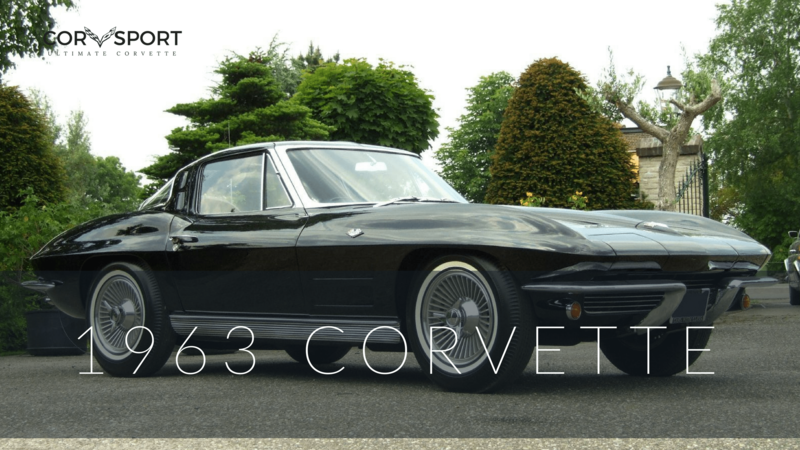 By late 1960, the Corvette had demonstrated again that it was a serious contender on the race track, both in mainstream media and in the automotive marketplace. CBS television, in cooperation with General Motors, introduced the series “Route 66”. (While it was common in that era for automotive manufacturing companies to sponsor television programming, this particular series featured a story about two guys who sought adventure in their shiny, new Corvette). 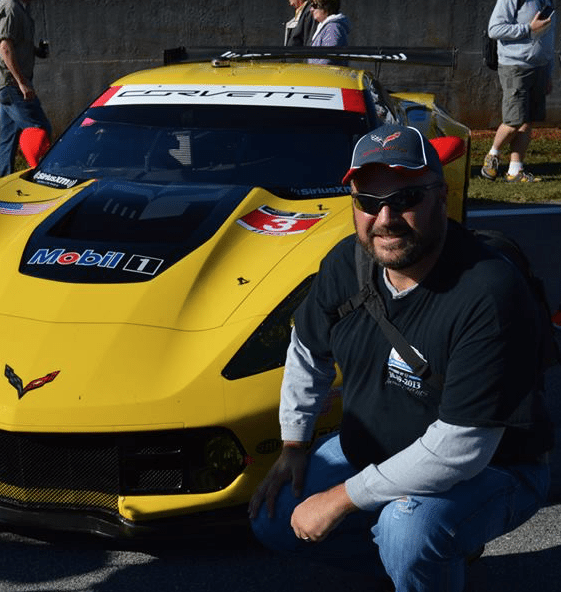 Bill Mitchell had begun the process of developing a prototype for an all new Corvette that would go on to become known as the “Mako Shark I.” He had also championed a team of Chevrolet designers in developing both cosmetic and performance upgrades to the existing C1 body styling. 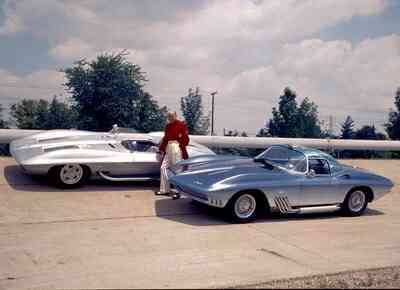 Bill Mitchell with the 1960 Stingray (left) and the 1961 Mako Shark I Concept (right). 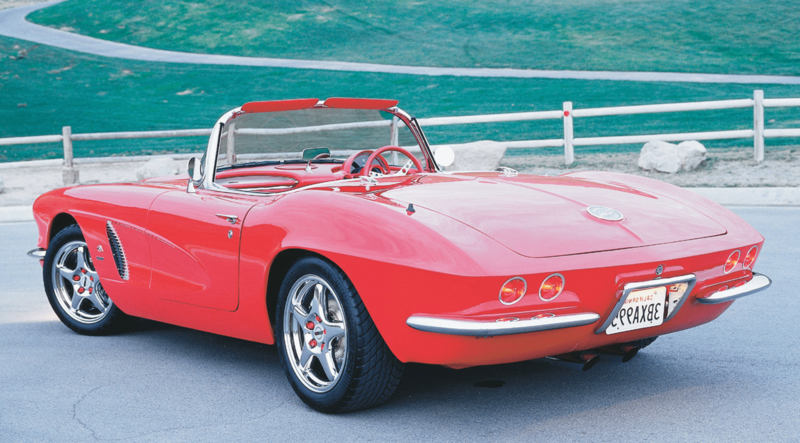 With Corvette sales consistently increasing over the previous two model years, General Motors executives decided to review some of Mitchell‘s designs and made the decision to “green light” a restyling of Corvette for the 1961 model year. 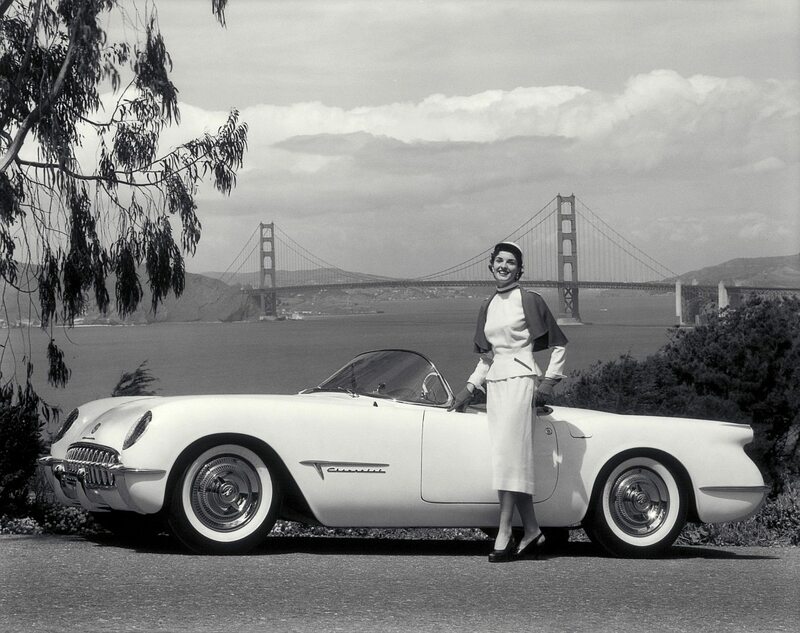 From a practicality standpoint, the redesign of the rear end of the Corvette enabled an increase in available luggage space by twenty percent (20%). The new rear end also showcased a pair of small, round taillights on each side of the license plate recess. (These re-designed tail lights would become synonymous with Corvette and would be a standard feature (in one form or another) on all future generations of Corvette). The Re-Imagined Rear End of the 1961 Chevrolet Corvette. A simple vertical crease line ran down the middle of the rear deck lid, passing evenly through the traditional, big, round Corvette emblem. The rear end of the car now featured a pair of small chrome bumpers that framed a third, small, chrome, “arch” bumper that wrapped around the license plate well. On the front end of the car, Mitchell redesigned the layout of the dual headlamp system, providing Corvette with a more streamlined version of the of the existing four lamp nose. Headlight bezels were no longer available in chrome, but instead were painted to match the rest of the body. Likewise, the chrome “teeth” grill was replaced with a fine wire mesh insert that was finished in argent silver. The round Corvette emblem that resided on the front nose of the car was replaced with individual block letters that spelled out the car’s name. This was topped with a larger version of the Corvette’s crossed-flags insignia. Other improvements were made to the Corvette’s body as well, though some were not physical changes to the actual lines of the Corvette so much as an evolution in the quality of how those body lines were put together. 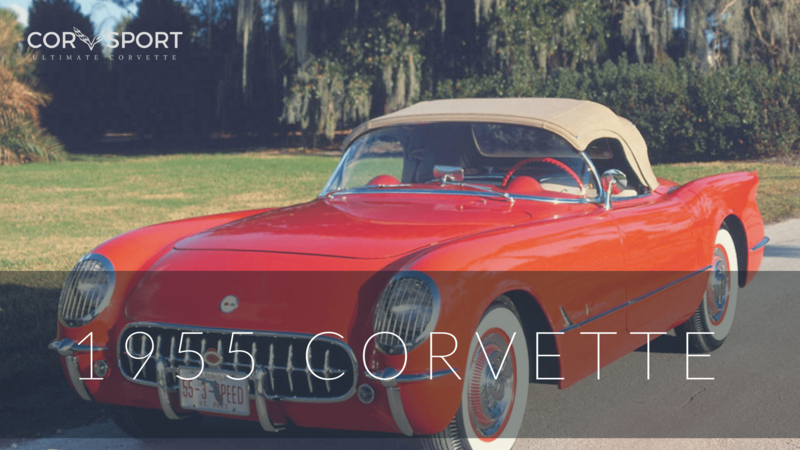 With improvements in fiberglass manufacturing combined with refined assembly processes improving the car’s fit and finish, the 1961 Corvette was quickly recognized by critics and enthusiasts alike as the best built Corvette yet. 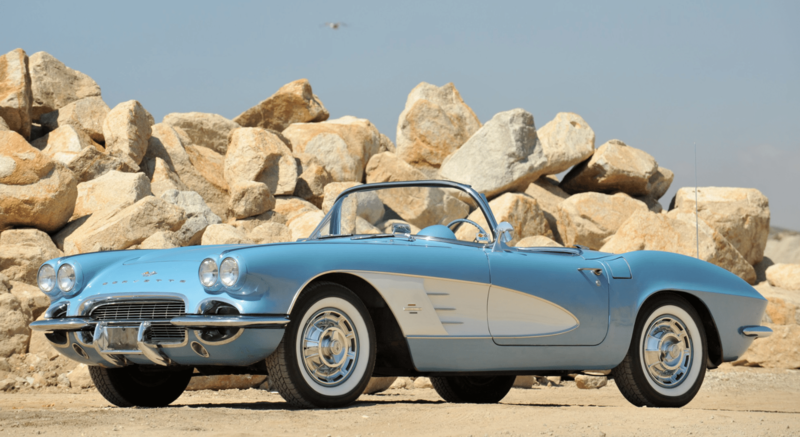 While the exterior received subtle improvements to it’s overall appearance, the interior of the 1961 Corvette went virtually unchanged from it’s predecessors. To increase space within the two seat cockpit, the transmission tunnel was slightly narrowed, though this single change did little to affect the overall appearance of the car‘s interior. Cosmetically, even the color options stayed largely the same. Four interior colors were made available: black, red, fawn, and blue. 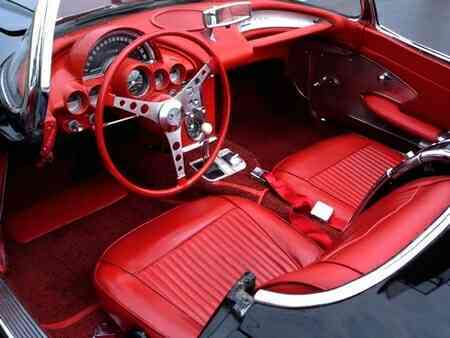 Interior of a 1961 Corvette. 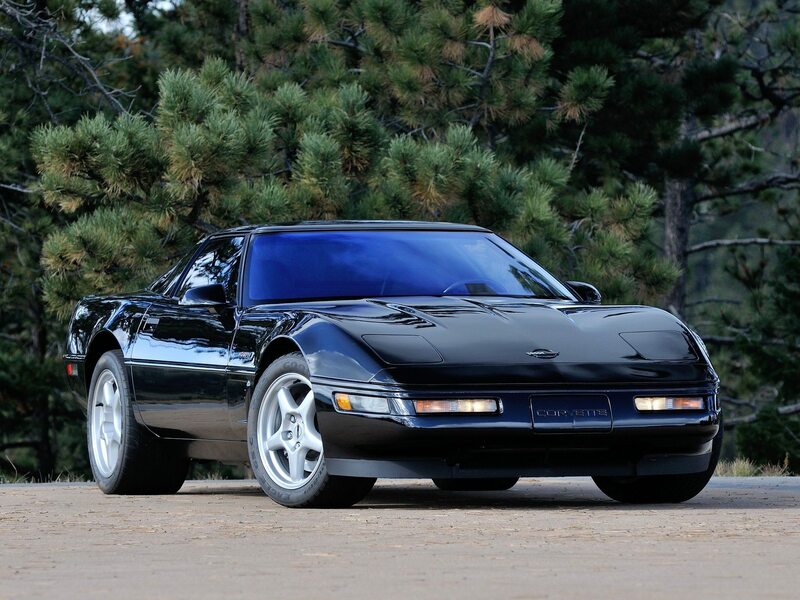 Of course, as the Corvette continued to evolve, so did the standard features that came with it. 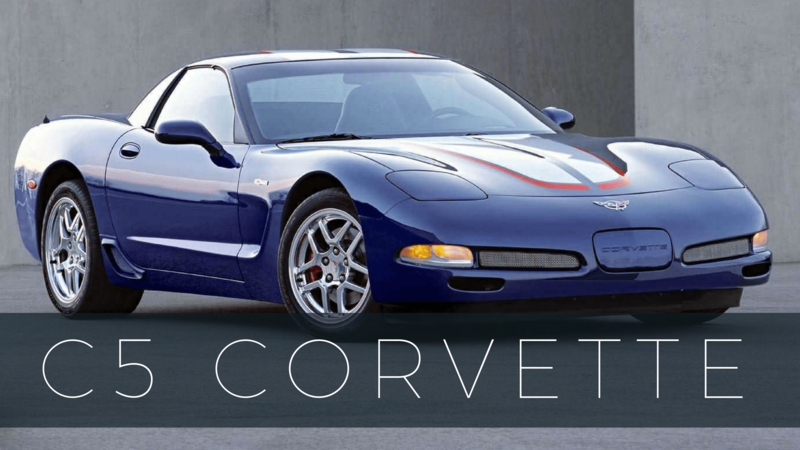 With a base price of $3934, the Corvette now included windshield washers, sun visors, a thermostatically controlled radiator fan and a parking brake warning light. The installation of a heater was still an option in 1961, as was the addition of a four speed manual transmission. 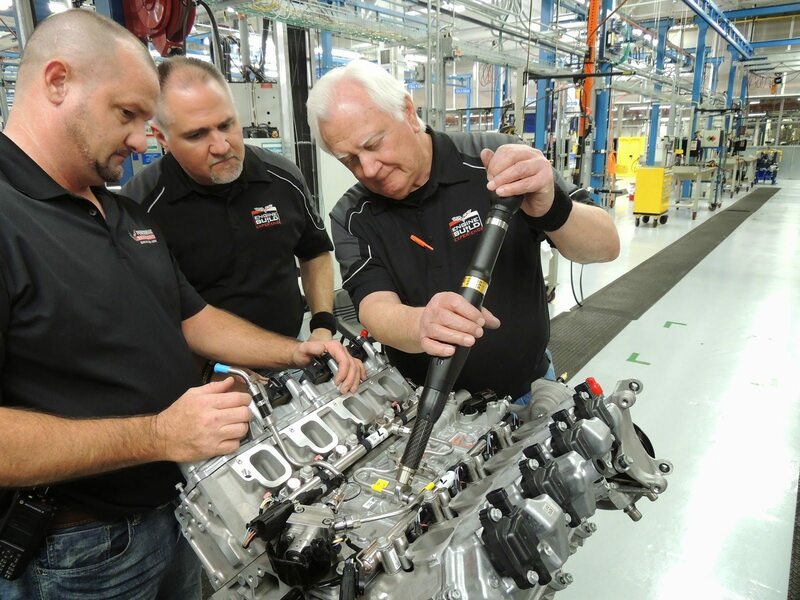 With respect to the latter, nearly seventy five percent (75%) of all Corvette customers paid the extra $188.30 to purchase the four-speed manual transmission, which was now clad in aluminum that shaved fifteen pounds from the overall weight of the car. Interestingly, air conditioning, power steering and power brakes were still unavailable, even as optional equipment, on the 1961 Corvette. However, the “Wonder Bar” signal-seeking AM radio remained available, as did the Positraction limited-slip differential, “wide” whitewall tires, electric windows, and a power operated manual top. 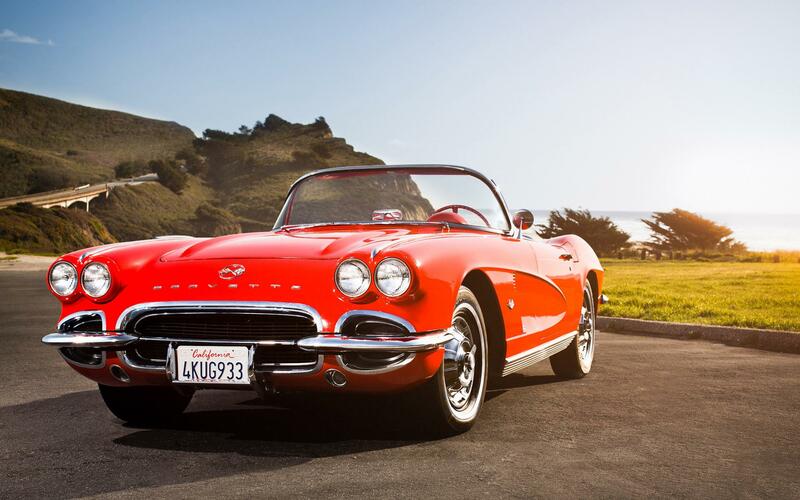 DID YOU KNOW: The 1961 Corvette would be the last Corvette to offer a consumer the option of purchasing bodyside cover in contrasting paint colors. 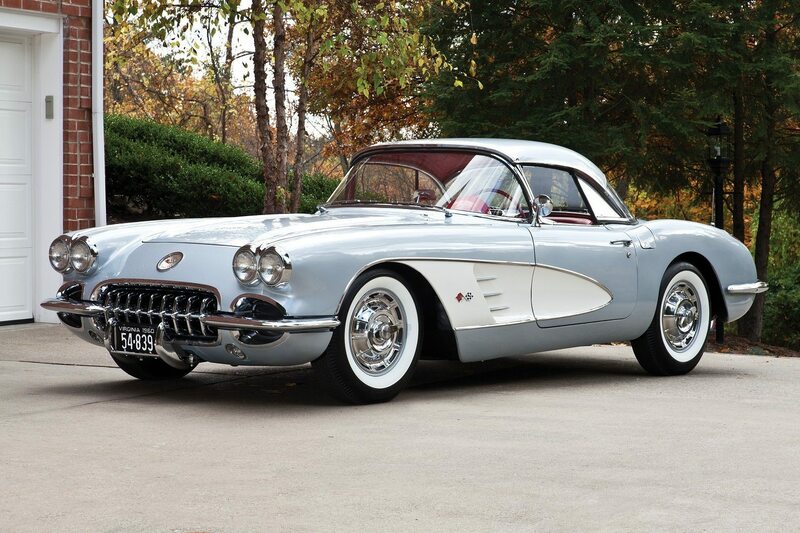 A mere $16.15 option in 1961, this was an option that most consumers readily ordered when purchasing a new Corvette. 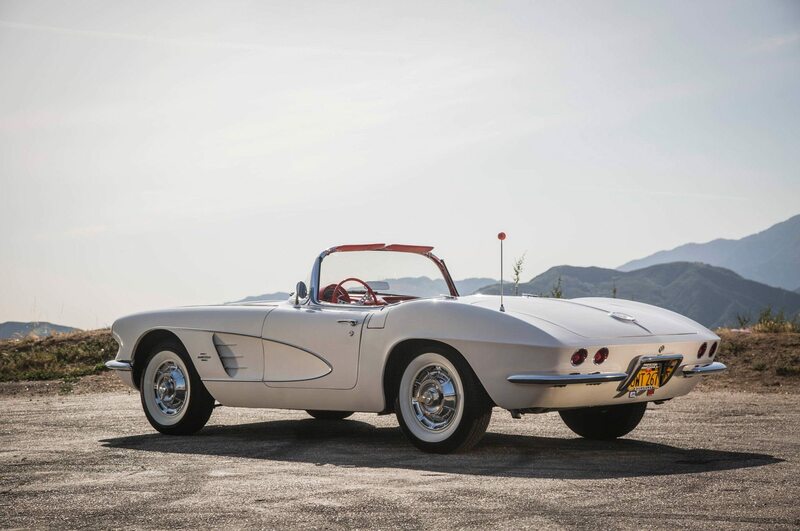 The 1961 Corvette was also the last model year to offer the option of “wide” whitewall tires as well as the last model year to offer the 283 cubic inch V-8 that helped launch Corvette into stardom! 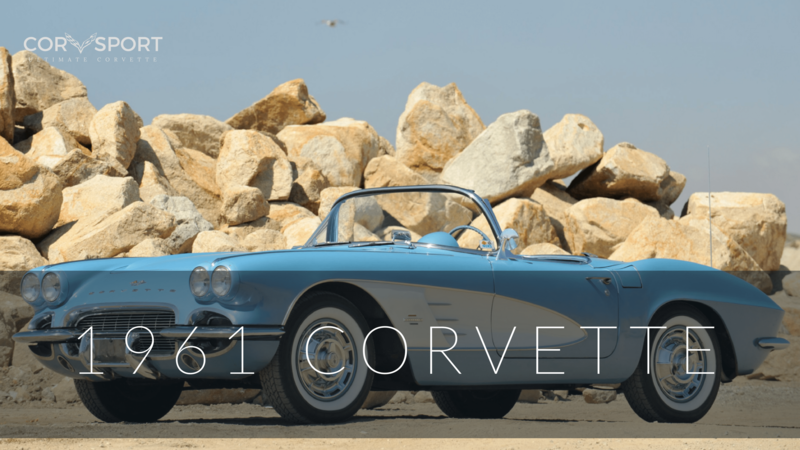 Mechanically, the 1961 Corvette was much like it’s 1960 predecessor. However, an aluminum radiator took the place of the previous copper-core unit. By adding an aluminum radiator, Chevrolet improved the cooling capabilities while further reducing the car’s overall weight. Side mount coolant-expansion tanks were added as a running change. 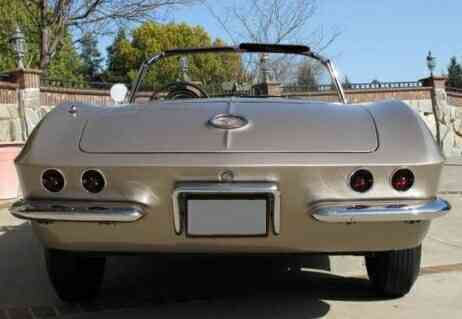 The available engines were essentially just carryovers from the 1960 Corvette. There were five, different versions of Chevy’s respected 283 cubic-inch V-8 engine made available to consumers, of which two were fuel injected. The three speed manual transmission gearbox remained the standard option but was now offered with a wider choice of axle ratios. Powerglide automatic transmissions continued to be made available as an optional transmission, though the automatic transmission did not have enough sheer strength to handle the additional torque associated with the larger engines. 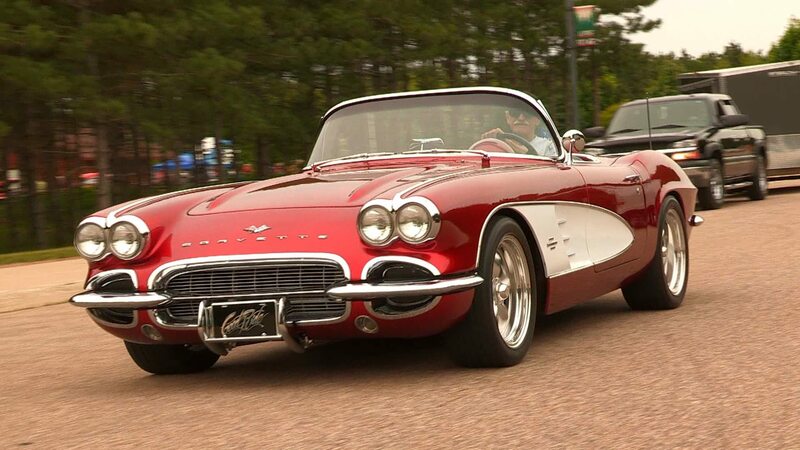 Besides, most Corvette enthusiasts were now actively seeking out manual transmissions, proved by the fact that nearly 90 percent of all the Corvette’s sold in 1961 were built with a manual gearbox. While Corvette continued to delay the incorporation of an independent rear-suspension, this did nothing to hurt the vehicle in sales or in performance. Automotive testers were enamored with the quality of the 61’s handling ability, and none of them identified any specific deficiencies or lacking in quality of handling due to the absence of an independent rear suspension. 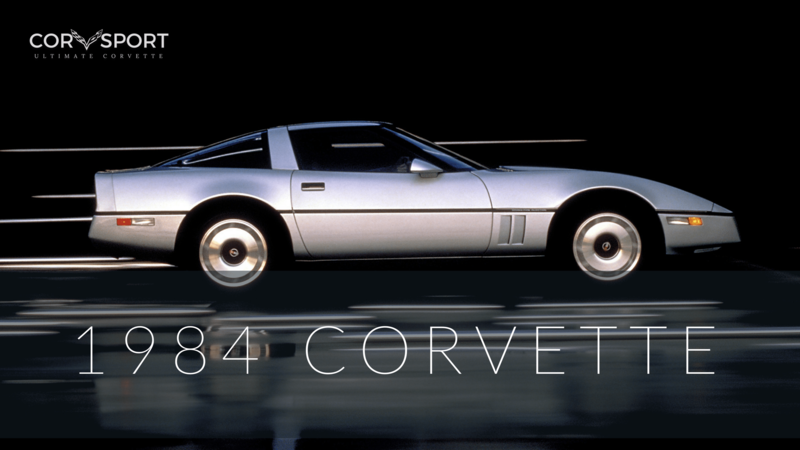 By the standards of that time, the Corvette was now recognized as one of the most roadworthy cars in the world. 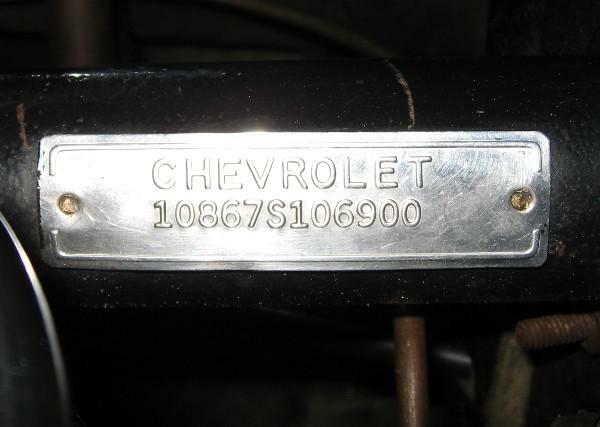 0867 (Second thru Fifth Digit) General Motors identification/series code for Chevrolet Corvette. 1XXXXX (Seventh thru Twelfth Digits) Production Sequence Numbers (or Unit Number). The last six digits begin at 100001 and run thru 110939. Each Vehicle Identification Number (VIN) is unique to an individual car. 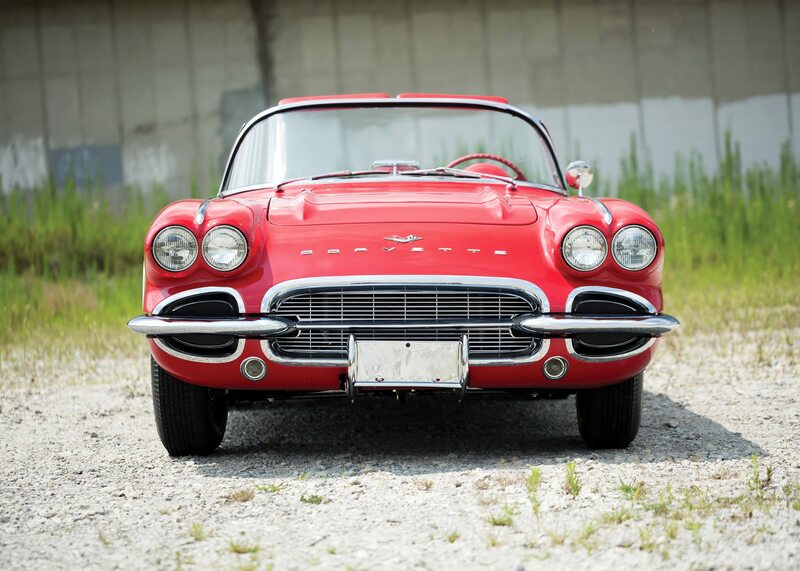 For all 1961 Corvettes, the location of the Vehicle Identification Number (VIN) is stamped on a stainless steel tag and secured to the steering column in the engine compartment. 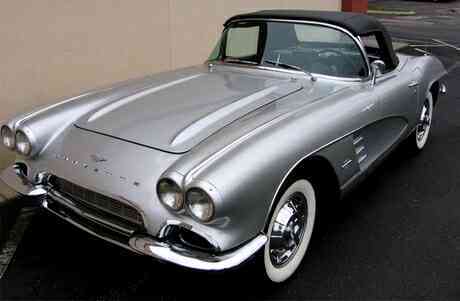 The base price of the 1961 Chevrolet Corvette without any optional equipment. An interior space/ cockpit heater. This PCV was applied to all Corvettes sold and delivered to California. 118 of the 1961 Corvettes were built with this engine. 1,462 of the 1961 Corvettes were built with this engine. Although the Auxiliary Hardtop is shown as an option, customers could swap the convertible top for the auxiliary hard top at no additional cost. Of the 5,680 Corvettes sold with this option, 2,285 of them were the result of this substitution. 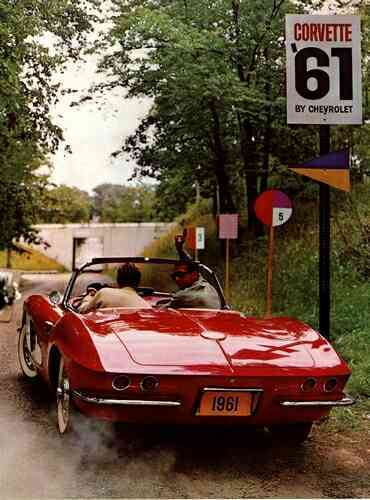 A total of 3,351 Corvettes featured the two-tone paint scheme in 1961. Of these, 954 were painted Roman Red/White, 647 were painted Honduras Maroon/White, 385 were painted Ermine White/Silver, 358 were painted Fawn Beige/White, 429 were painted Tuxedo Black/Silver, 419 were painted Jewel Blue/White, and 159 were painted Sateen Silver/White. 2,827 of the 1961 Corvettes were built with this engine. 1,175 of the 1961 Corvettes were built with this engine. Unlike the 1953-1955 Corvette Roadsters, which had an optional top that could be attached to the car, this convertible top was an integral part of the design, allowing the 1961 Corvette to be classified as a true convertible. A “limited slip” rear axle that engages both rear wheels as drive wheels. For 1961, RPO 675 required that the Corvette have a manual transmission. An optional four-speed, close ratio, syncromesh manual transmission. This option included a “T” handle with positive reverse lockout. Optional sintered-metallic brake linings which increases braking effectiveness. They comprised of three pairs of lining segments that were riveted to the primary brake shoes and five pairs of slightly thicker segments for the secondary shoes. Drums were finless with this option but were flared at their open ends to enhance cooling. The sintered linings made braking less harsh than the Cerametallic material and needed far less warming up to provide maximum braking effectiveness. They were developed by GM’s Delco-Moraine Division. Optional black sidewall tires to replace the standard white sidewall. Special fiberglass fuel tank that allowed for greater fuel mileage by reducing weight. 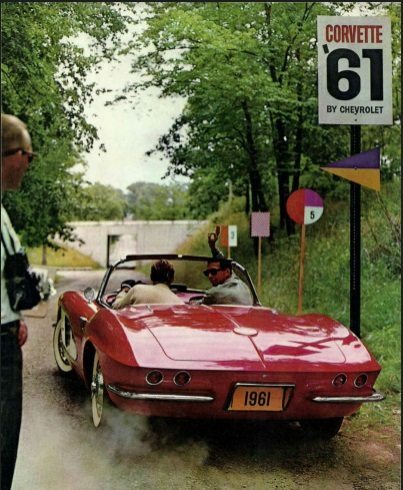 Download this 1961 Corvette Dealers Sales Brochure for a quick look at the features of the car.